The Makk artists many times are commissioned to create murals whether it be for a private home, corporate setting or a church ceiling. Americo Makk has been called a “modern-day Michelangelo”. Working together with Eva Makk since 1950, he has painted large murals in sixteen cathedrals and churches on two continents. This feat is unequaled by any other artist in our time, giving the Makks a place forever in art history. 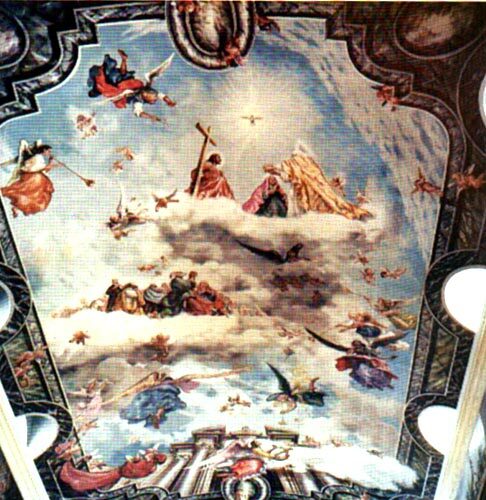 Their most famous work, on the ceiling of the 150 year old Manaus Cathedral in Brazil, is the world’s largest single-themed ceiling mural. Murals can range from a large painting size of 5′ x 7′ all the way up to full cathedral ceilings as seen on this page. Eva Makk and Americo Makk were commissioned by the church in Brazil to paint many murals in the 1950’s when they were only in their 20’s! The duo painted the largest single-theme painting in the world, 261 square yards in a cathedral in Manaus Brazil. Many tourists photograph it on a daily basis. Please use the form below to request pricing for existing paintings, or to contact us about a custom work. It may be easier for us to speak with you about your requirements. So that we can give you a better idea of the cost and scope of work, please let us know a bit about the mural. Does this mural need to be painted on site, or can it be painted in our studio, and installed at the site? In what location (country, city, state, building, etc.) will the mural be displayed? Please provide as much information as possible. If you have photos or documentation you'd like us to see, please upload them here. You may upload a total of 3 docs or photos. Each may not exceed 5MB.